If your home has a sump pump, it is there for a very good reason. Even if you have a completely unfinished basement, your sump pump is crucial. It is your first line of defense between a flooded basement, a potentially ruined foundation, mold issues, health issues, and ruined furniture. Too much water overwhelming pump. Sump pump humming but not pumping. Sump pump jammed by mud. Broken pump impeller or drive shaft. You can visibly see rust on or around the pump. It is over 7 years old. You don’t remember when it was last replaced. Your pump makes very strange noises. Your pump vibrates excessively when running. Your pump used to run when it rains, and you haven’t seen it run in a while (a clear sign your pump has died!). In addition, Plumbing 911 offers affordable Battery Backup Sump pump System. These backups have saved homes from flooding during a major storm, electrical outrage or the primary pump failing. 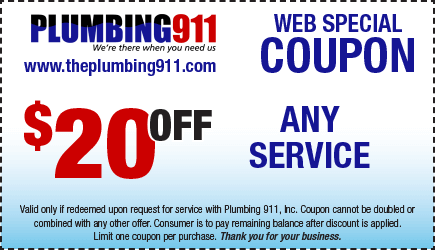 Call Today for a free inspection on your area.